You are currently browsing the tag archive for the ‘Power of routine’ tag. We’re into the winter feeding schedule at the pasture, which means the hay truck has become the new object of interest. No more nibbling delicious sweet green grass. Breakfast and dinner come in the form of flakes of hay tossed from the bed of a pickup that has frankly seen better days. But the horses don’t care what the truck looks like. They just care that it comes. At the regularly scheduled time. And is filled with hay. 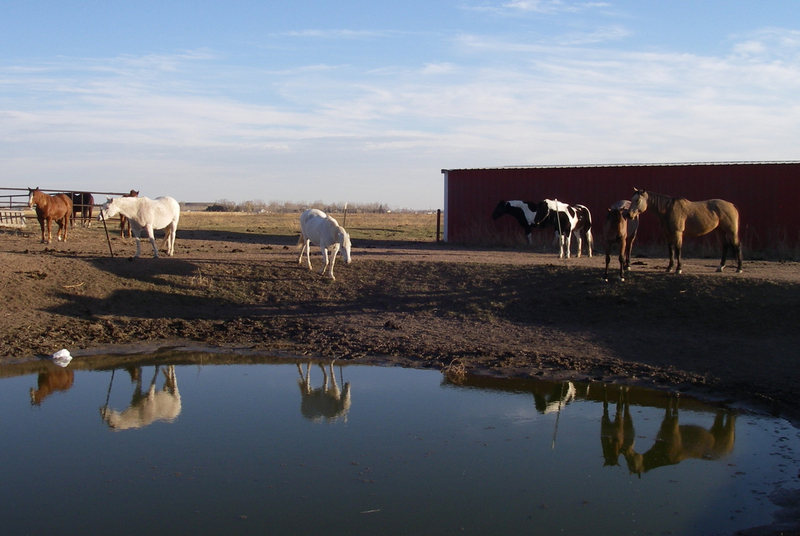 Somewhere around three in the afternoon, the herd gathers by the pond (and close to the gate) to wait for the truck. A few mill about, but most are laser focused on the hay barn. 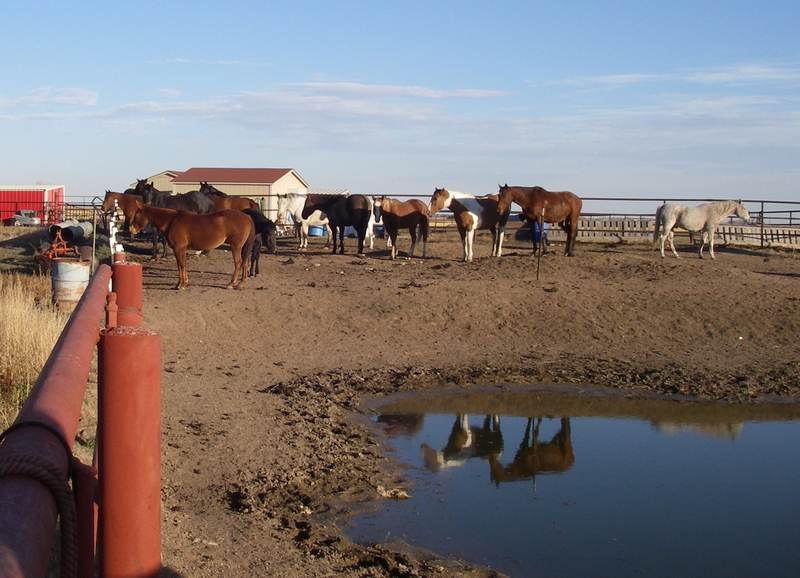 The horses quickly picked up the shift from the summer to winter-feeding routine. They have no watches or timers, and yet they know exactly what time it is. Of course they’re hungry, which adds a significant incentive! It reminds me of one of our favorite vacation spots in Mexico. It’s a wonderful little hotel completely off the grid. We set our watches aside when we’re there. What’s the point? So when the sun sets, the hotel guests begin to wander to the dining room. We usually gather first in the lobby for a cocktail and to hear about the many adventures of the day. Like the horses, we quickly attune ourselves to the rhythm of the place. We know exactly (give or take) when dinner will be served. And like the horses we mill about, occupying ourselves with margaritas and small talk until the main event. I couldn’t tell you the actual dinnertime. But I can tell you that a meal is served every single night. And we manage to get ourselves there with no help from a clock or watch or dinner bell. It’s amazing really what happens when we get in synch with the natural rhythms around us. 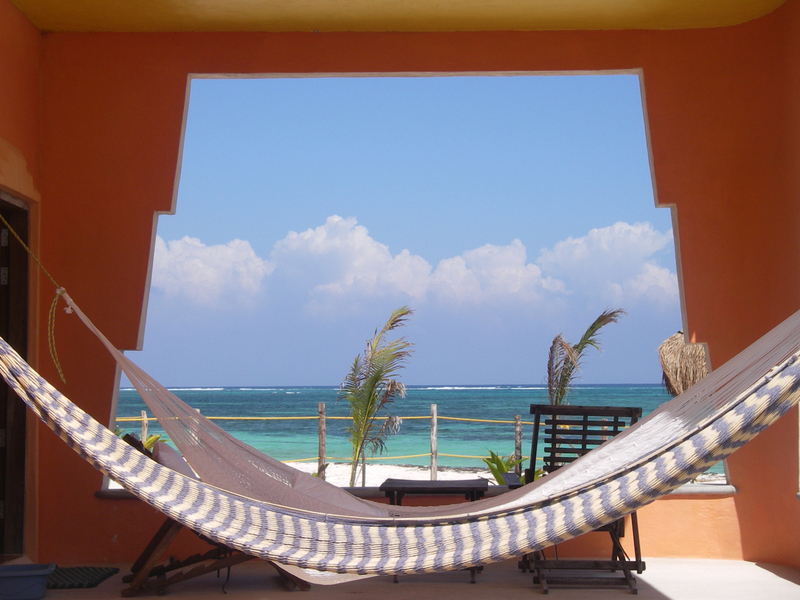 I usually have to go camping or off the grid in Mexico to allow myself to wind down and tune in. It’s something the horses have known forever. This is our boy. Our big-hearted, mellow, full-of-personality-appaloosa. There are many things I adore about Bud. In fact, a while back I made a list of ten. It could easily be a list of one hundred. He’s just that lovable. Every day, he’s at the front of the line, waiting for me to bring his grain. 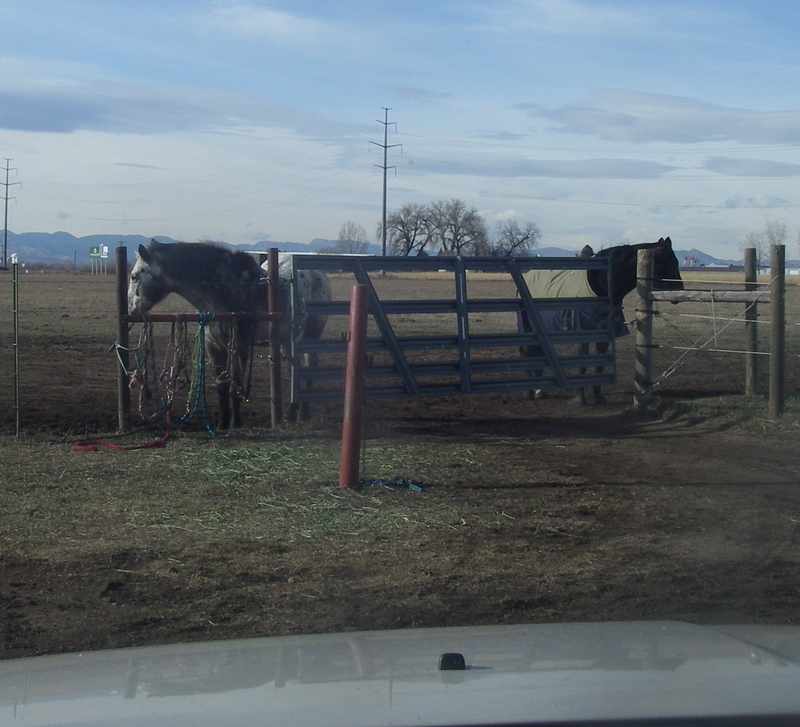 Most days when I drive up, the first horse I see is Bud. Even from a distance, he stands out because of his spots. He positions himself at the gate, so hopeful, so confident, and so ready to eat. He seems completely comfortable waiting for one of our vehicles approach. He just knows we’re coming. I can’t bear the image of him waiting at the gate and me not showing up. We’ve trained our horses to this routine, and now the responsibility is mine to carry through. I’ve said it before, but I think it bears repeating. Animals help us to be better humans. My relationship with Bud and Pepper has given a structure to my day. An unbreakable routine, that honestly I haven’t had since my son was a baby. Other than going to work every day (when I was doing that,) I’ve found a way to weasel out of most of the routines I’ve tried to establish. Now, I’m trying to apply that same adherence to routine to some of the other parts of my life. Things like exercise, house cleaning, grocery shopping etc. If you had to say, would you describe yourself as routinized or a free spirit? Yesterday I mentioned that the weather has turned cold here in Colorado. On the thirtieth we braved the elements to get our two old sweeties into warm coats. It’s what any good parent would do. Right? Little did I know there were more challenges ahead. The morning of New Year’s Eve dawned crisp and cold. In town the wind had died down and I thought that was a good omen. After all, what’s a little snow and cold to a girl raised in Wyoming? 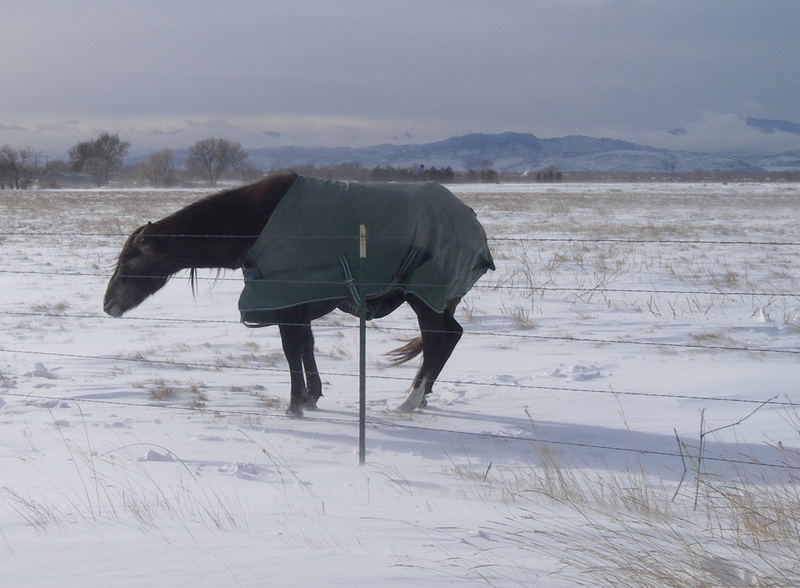 About half past noon I bundled up, filled the feed pans and headed to the pasture. The temperature gauge on the car said it was five degrees. I tried to ignore that little tidbit of information. As I drove across the Interstate, I thought for a moment I was back in the Pacific Northwest. It was blowing snow that swept across the road like the Death Eaters in a Harry Potter movie. I turned into the boarding facility and headed down the lane toward the back pasture. By now the wind was howling and visibility was significantly reduced. I considered turning back, but kept going. I knew the horses needed the extra calories from the grain to help keep them warm. And there were the daily meds. 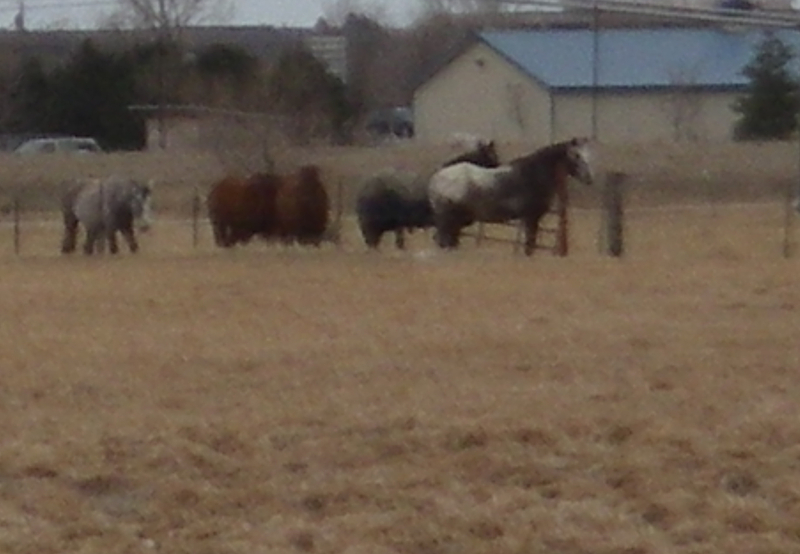 I was scanning the pasture trying to find Bud and Pepper. I wasn’t paying attention to the road and drove smack dab into snow that had drifted across the road. I rocked the car, trying to free it, but that only seemed to dig me in deeper. Thank God for cell phones. I called Rick to come rescue me. I figured while I waited for the cavalry I’d go ahead and feed. I couldn’t see the sweeties anywhere. I started to walk toward the shed, thinking it was a very good bet that’s where they were. Yep. The whole herd of oldsters was there. Amazingly the shed was dry, out of the wind and somewhat warm from the sun. I couldn’t bring myself to lead the horses away from shelter into the wind and blowing snow. So I walked back to the car and got the feed pans. That’s trip number three across a very long, windy, freezing pasture. And by the way, those pans of grain are heavy. Especially when you’re trudging through snow. My hands were going numb from the cold, and I was exhausted. I literally kept saying to myself, “You can do it. Only one more step.” Then I’d say it again. This was turning into quite the Little House on the Prairie moment. But I made it to the shed. And there was one very happy appaloosa to greet me. Pepper on the other hand wasn’t so sure she wanted to leave the shelter. I got Bud started and then went in for Miss P.
She was lame again, which explained why she held back. Her leg hurt. I put a halter on her and led her around the deepest drifts to the food. I had to hold her feed pan, because she couldn’t put weight on her leg and I really wanted her to get the Bute as well as the grain. Eventually she ate, Bud finished and I handed out a few snacks to the oldsters. I grabbed the empty feed pans, halter and my determination and headed toward the car. That’s when my knight in shining armor drove across the field to pick me up. I was never so glad to see him. 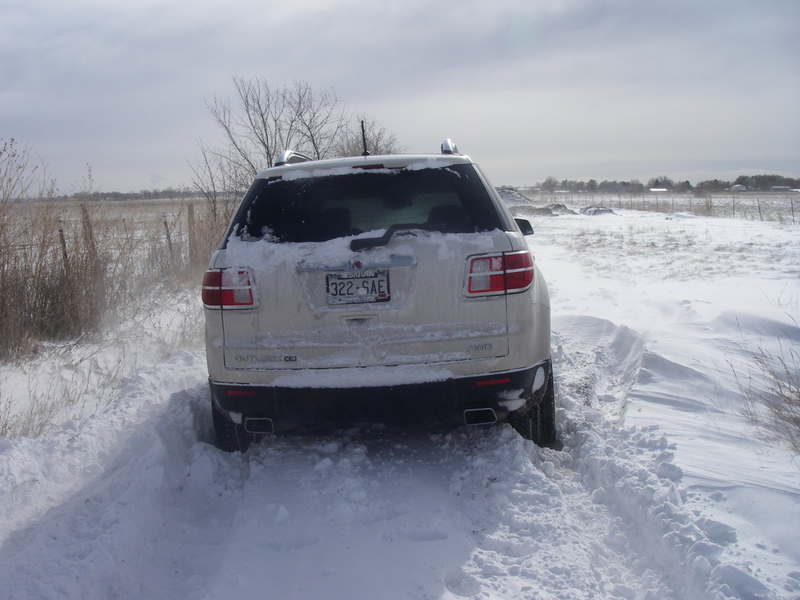 He and another boarder dug my car out. It took me the rest of the day, an afghan, one of those rice bags you heat in the microwave, and a twenty-minute shower to defrost. And I was worthless at the party we went to that night. I dropped into bed long before the ball dropped in Times Square. Just another day in the pasture. When you share your life with animals – especially large animals like horses, cattle, and llamas that live outdoors, you have to dig really deep on days when it would be much easier to skip a feeding. But here’s the thing, they need care every day – not just the days when the weather is nice. This commitment to the horses has taught me something about myself. I’ve always been a hard worker, but I haven’t always been disciplined. There are still many areas of my life where I could use a strong dose of do-it-every-day-discipline. So maybe that’s my intention for the New Year. I’ll choose one more thing and show up every day. As if my life depended on it. Because I’m starting to think it just may. When it comes to setting boundaries, being consistent, and walking your talk, animals and children are hands down our best teachers. Perhaps it’s that they aren’t tainted by the minutia of life as most of us adults are. Or maybe they’re closer to the Divine, without all the clutter that comes with age and living in the modern world. I don’t know the answer. It’s a big topic that much greater minds than mine have tackled. These days in the pasture, Miss Pepper is the teacher. In her persistent, equine way she asks us to clarify our expectations. Her brown eyes search us, waiting for the answer. It is the rule we’ve made that she has to eat her grain before she can have snacks. And yes, it’s very similar to a parent’s rule for kids to finish dinner before getting ice cream or cake or whatever the dessert is that day. I talked about Bud and Pepper’s dessert bar in an earlier post, if you want a refresher. So Pepper is teaching us about backing up our words. 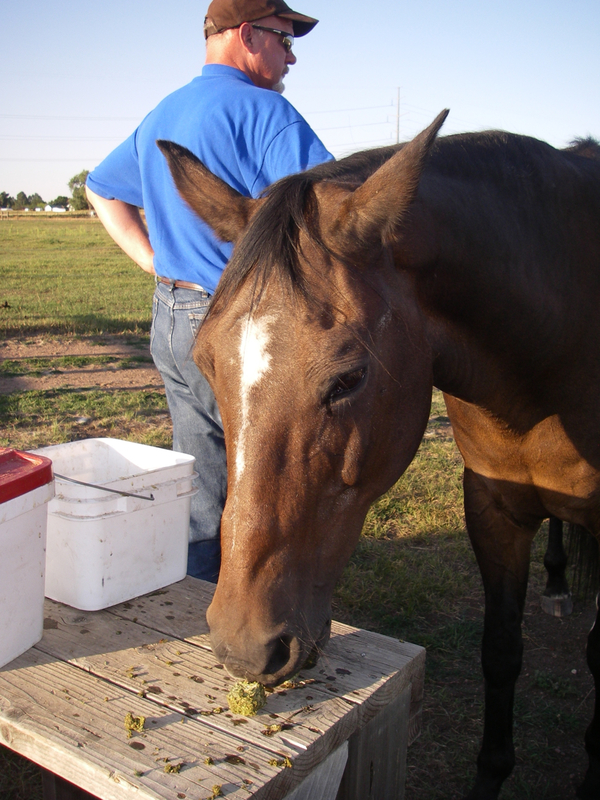 Some days she will take only a few bites of her medicine-dosed grain and then amble to the dessert bar, ready to eat her fill of Horse Candy and alfalfa cubes. My husband, who is much better than I at enforcing the rules, will walk to the car and look at Pepper’s feed pan. If it still holds grain, he directs her back. And she goes, albeit with a touch of attitude, and often a huge sigh. Usually she complies on the first redirect, but not always. There have been a couple of days when this little drama gets played out two or three times. Miss Pepper is a smart girl and she offers us plenty of opportunities to learn. We’ve been consistent (yes, even me!) for a few weeks now, and our girl has figured it out. Oh, she still will test us. I mean, what self-respecting mare wouldn’t try? But now all we do is step in front of her, and she sends herself back to finish the grain. And my take away learning from this? There are probably many, but this morning as I write this post, I think the nugget of gold is that consistency and routine are extremely powerful actions. There you have it direct from Miss Pepper and the Dalai Lama. I guess I’d better listen!